The heat was turned way up on a cold Toronto night on this past Friday (Feb. 27), as one of the hottest emerging bands in music played the venerable Lee's Palace. 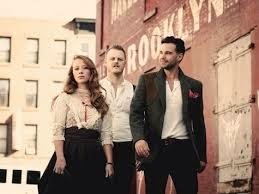 The Lone Bellow, the Brooklyn, New York-based Americana band, have acquired a well-earned reputation as being one of the top independent touring acts on the road today, and this sold-out performance only enhanced that reputation. Opening their set with the title track to their just-released album "Then Came The Morning", The Lone Bellow showed why they are the clear front runner as a breakthrough act in 2015. The strong vocals and stage presence of this group is electrifying. The charisma of Zach Williams as the de facto emcee of the show, helps to make the crowd feel as if we're in their living room watching this performance. Not an easy task for even the most veteran of performers. The harmonies really shone through on "Marietta", another incredibly well written track from Then Came The Morning. Intended or not, "Take My Love" is a great song that's reminiscent of Canadian Maritime music in the vein of the Canada's legendary Great Big Sea. This got the crowd of roughly 1,000 up and moving, and was the evenings first real sing along. Indeed, the crowd was thoroughly engaged with this act and the proceedings on stage, singing along and hushing each other appropriately. A short acoustic set showcased the lead vocals of multi-instrumentalist Kanene Pipkin with a cover of Paul Simon's "Slip-Slidin' Away" and lead guitarist Brian Elmquist on "Watch Over Us." The talent of Kanene and Brian cannot be understated. The energy and fervor that Brian brings on guitar is infectious, passing that energy to his band mates and the crowd. Kanene could be one of the best female vocalists touring in a band today, as well as one of the most talented instrumentalists as she takes turns on the bass guitar, mandolin and keys. It is rare to see chemistry such as you'll find with The Lone Bellow. At one point in the evening, Zach Williams stated that it's been two years since all of them quit their day jobs to devote themselves full time to The Lone Bellow. That gamble has clearly paid off. All one has to do is look at the tour page of their web site, where you will find a string of sold out shows all over North America. Once you attend a show, you will want to keep going back for more ... 2 hours of showtime just doesn't seem enough for a band this good. I kid of course, because a show like this must be exhausting for all on stage. But when you're as talented as the three front members of The Lone Bellow and their two backing musicians, you can't be blamed for feeling a little greedy for more time. And I will predict this: If Jason Isbell was the breakthrough artist in 2013 and Sturgill Simpson was the breakthrough artist of 2014, then 2015 will be remembered as the breakthrough year of The Lone Bellow. This group is going to be around for a long time.